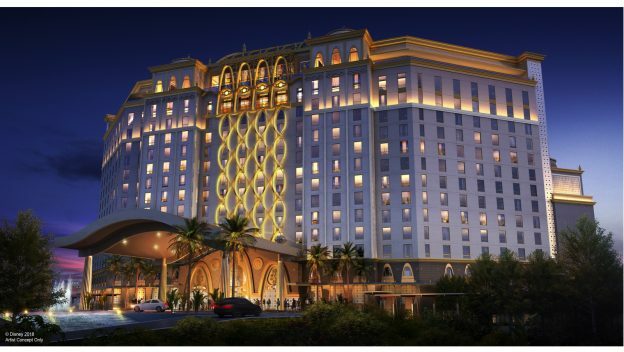 Disney’s Coronado Springs Resort will soon be home to a 15-story tower that will add 545 guest rooms (including 50 suites) to the resort. Disney has released some concept art featuring the new tower’s two-story lobby and renderings of the new rooftop dining area. This area will provide guests with amazing views of Walt Disney World Resort – including nighttime fireworks. The rest of Coronado Springs is also getting a makeover! All of the resort’s more than 1,800 rooms have been updated with new fixtures, furnishings and lighting. And, a new restaurant will be opening in the middle of Lago Dorado, with walkways for guests to reach the restaurant from all around the resort.